This is incredible. Almost 70% of the calories in the traditional Okinawan diet came from sweet potatoes. That according to an extensive investigation of six decades of archived population data published in 2007.1 And that wasn't the only carbohydrate they ate. Rice and beans also played prominent roles at mealtimes. Theirs must have been the mother of all high-carb diets. I've been reading about the people from Okinawa, a series of little islands right smack in the middle of the East China Sea. The islands belong to Japan (Okinawans are Japanese), but are geographically close to Taiwan and mainland China. Okinawans are known for their long lives. Not only do they enjoy some of the longest life expectancies in the world, but they also have one of the highest number of centenarians - people who have lived 100 years or more - about 50 centenarians per 100,000 people, compared to 20 per 100,000 here in the US. They live long, and they do so with exceptional vigor. Okinawans have low rates of many of the chronic diseases Americans bear: diabetes, heart disease, cancer, and dementia. Or at least they used to. Changes in lifestyle from the 1950s - food choices, caloric intake, and physical activity - have eroded their mortality advantage. When 85% of your calories are coming from carbohydrates, it leaves very little for the other 2 macronutrients, fat and protein. Indeed, a diet that gets about 10% of its calories from fat, a la Dean Ornish, would have been considered lavish here. This diet racked up a mere 6% of calories from fat. Fish, which I assumed would have constituted a fair portion of their diet, didn't. At 1% of total calories, it's about one 3-ounce serving of fish a week. And meat (including poultry) was considerably less, perhaps one small serving a month. One egg every 2 months. Added oils, at 2% of total calories, works out to about 36 calories. That's less than a teaspoon a day. The bulk of the diet came from those 849 grams of sweet potatoes, about 4.5 cups a day! Rice (the article mentioned that Japanese rice half a century ago was not polished and likely included bran and germ) was consumed at about 1 cup/day. That was considerably less than the rest of Japan at the time. Theirs was a very low-fat, low-protein, just about vegan, diet with very few processed grains and oils. 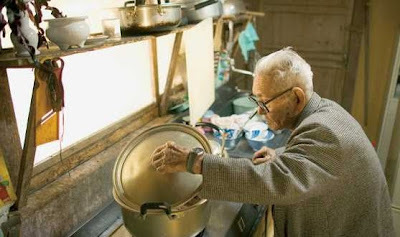 This isn't saying that the foods Okinawans ate were the primary factor in their longevity. But they certainly didn't impede long life. Photos of Okinawans from National Geographic. Maybe it's the American influence on their diet that has led to the current obesity problem? There's an Marine Corps base on Okinawa - I'm guessing it was established just after WWII. There would have been interaction between the islanders and the military from the beginning (as cooks, maids, gardeners). "The Okinawan sweet potato has been the main carbohydrate of the Okinawnan diet from the 1600s until approximately 1960, accounting for more than 50% of calories." From my other reading, the sweet potato is indigenous not to the South Pacific but to South America. I guess it made its way to these islands on the back of the Spice Trade. I would love to try this "Okinawan Sweet Potato." I tried a "Japanese Sweet Potato" several years ago and I'm hooked! It's unlike any other yam, sweet potato or other potato I've ever had. It's unbelievably good, like pudding. This Japanese variety is grown in Peru and imported. "After 1960 ... Westernization (increased fat, meat and bread) of the diet occurred ... with large shifts in energy balance." Yet Okinawa remains a longevity hot spot. May have something to do with their cultural practice of "hari hachi bu": Eat only until you are 80% full. The japanese sweet potato is white and has a chestnut flavor to it, am I right? Some vegan people don't consume much sweet potato as they say it lowers the iron in blood and that can be a problem is you don't consume too much iron. The analysis of the sweet-potato-heavy Okinawan diet in this study showed that it provided over 100% of the Japanese RDA for iron. "Concomitantly, there has been a significant slowing of life expectancy gains over the last two decades." sweet potatoes are my favourite starch. just for the record, i just completed a 20-day vegan largely fruit and veggie-based diet. i lost 5 pounds and changed my body fat percentage from 19.6% to 16.7%. that experience and this article have prompted me to reconsider skewing my diet towards more protein and fat. I need to read that full article. As I mentioned before, in a previous comment on your other blog, I'm interested in the calorie restrictive diets. I refer to those that are meant to permanently lower one's calorie consumption. I'm by no means sold on them yet, but I'm interested. Sorry I'm just getting back to this now, shaun. I had been reading about calorie restricted diets for longevity from references in the Okinawa studies. Pretty neat. It looks like some of their mechanisms can be activated by restricting certain nutrients instead of restricting calories (within reason). Low protein diets, especially low in certain amino acids, such as those containing methionine, seem to offer an edge for longevity and for quality of life. Animal foods contain amino acids high in methionine, seafood especially. I'm still reading about all this. "Dietary Protein Restriction Decreases Oxidative Protein Damage, Peroxidizability Index, and Mitochondrial Complex I Content in Rat Liver"
The Okinawans had a low protein diet, much of the protein they did eat was from vegetable sources. I loved that Natl. Geographic video, and the article about Okinawans! Interesting that the 7th Day Adventists are the only one of these longevity cultures that hasn't begun to waver toward obesity and shorter lives. I read that the sweet potatoes eaten by the Okinawans is actually dark purple inside and very high in anthocyanins which, if true, may be factor in their overall longevity as well. Blessings. Yes, the Okinawan sweet potato is not like the sweet potato most people are familiar with. They're fairly common in Hawaii, but not so much on the mainland. They are deep purple, and contain 150% of the antioxidants of blueberries. They're incredibly good for you. And delicious. Yes the Okinawan sweet potato is not the sweet potato most people are familiar with. They are deep violet in color on the inside and much greater in antioxidants than blueberries. They are also rich in folates, vitamin B, etc. They're pretty common here in Hawaii (and absolutely delicious), but not so much on the mainland. Looked for sources of Okinawan sweet potato slips here in the U.S. (mainland), & the one or two places that sell them say that it's just not a hot enough, long enough season here to grow them. Nonetheless, I suspect that part of the Okinawans' longevity is the physical exercise their traditional lifestyle involves, and not simply their diet, though that's undoubtedly a big factor too. Have you seen them in stores around here, Bix? Just about vegan? The staple cooking fat in Okinawa is pork lard! This is their traditional diet, not their current diet. The above figures are misleading because the imo, unlike the conventional sweet potato or yam, contains approx. 1 gram of fat per 1 cup or about 5.2% of its calories are fat. Therefore, the daily fat content listed above is 3.6 calories too low, upping it to 9.6 calories per day. This means that the Okinawans actually consume 1.6 calories of fat per day more than their Japanese counterparts. The above figures are misleading because the imo (unlike the orange sweet potato) has about a gram of fat for every cup, or 5.2% of its calories are from fat. Therefore the daily fat intake listed above is 3.6 calories too low. This means that the Okinawans actually consume 1.6 calories per day more from fat than their Japanese counterparts. 1.6 calories of fat? What are you talking about?!! I eat Japanese sweet potatoes all the time and they're no fattier than others. IMO people will believe anything to keep eating the same old crappy foods! I also eat the purple-skinned, yellow-fleshed Japanese sweet potato regularly along with the orange-fleshed sweet potatoes and don't see a difference. You don't know what type of potato was included in the analysis, or what nutrient breakdown was used. It may be they used the imo already. If the gentleman is correct about these potatoes being fatty, it indicates that a diet high in omega-6 fat promotes longevity? WOW, My fiance is Okinawan, specifically from Naha, then transplanted to Yomitan. Her father gained a bit of weight living in the fast paced area of Kokusai street. Then after moving from there he lost a bunch of weight, hence my beleif that WESTREN FOOD is the devil. Double edged sword as it were.....our physical stature has grown rather quickly, however we are giving up a bit of health and wellbeing. BUT...........I having been there and living in mainland Japan for 3 years, dont yet see any real signs of obesity. Sorry. Go, Go, goya champuru!!!!! I could not figure out why Body FX was using the purple sweet potato as the "Clean Carb" product until I started researching. The more I learn about the "Okinawan" sweet potato the more I'm actually getting it. I didn't realize in fact that it was the same item that Dr. Oz was talking about a year or two ago. Pretty amazing stuff. I enjoyed reading up more on this, and learning about the famine as well since I've just watched the "Eat, Fast and Live Longer" documentary. Thanks!! something is inaccurate in the fiber as it appear 23 g - just 849 g of sweet potatos is 25 g fiber so it is impossible that they consume only 23 g fiber. Good point about the fiber. I just checked NutritionData and it says about 21 grams of fiber in 849g sweet potatoes. But they ate other fiber containing food, brown rice and beans, so their total fiber seems to have been underestimated (at 23g)? 849 grams of sweet potatoes can work out to 69% of calories if the potato is more caloric than ones we are familiar with in the US, and that are listed in our food databases. The Japanese sweet potato is denser, sweeter, and drier - and so more caloric - than many other varieties. The Okinawan potato may be as well. I've been reading about the people from Okinawa. I also read the comments and this article. Okinawa, a series of little islands right smack in the middle of the East China Sea. The islands belong to Japan (Okinawans are Japanese), but are geographically close to Taiwan and mainland China.Therefore, consideration to it's geographic position, as well as, the fact that being small and limited on mixing long standing genes, could also have contribuited to adaptations of natural occurrances, such as the diet, the daily activity and the people's routine. They are genetically adpated and long life remains in their genes. The activity part...well being active is now well researched and it helps mobility, agility, memory and balance, thus prevent falls and possible other incidents(Van de Rest et al). One cannot just place the benefits on sweet potatoes: take for example the saouth american diet, which consume sweet potatoes, yames, other root foods, aswell as rice and beans on a daily bases. There are current comprehensive studies (Santoro et al and Berendsen et al), which are looking into aging and long -life, aiming to establish degenerative aging causes and so on... Furtheremore, more consideration on life styles, less social isolation and hydration on how it can influence long life and above all not the quantity , but having alongside the quality of live! MSc,BSc (HONS), Public Health, Matron, RGN; County Durham , UK. 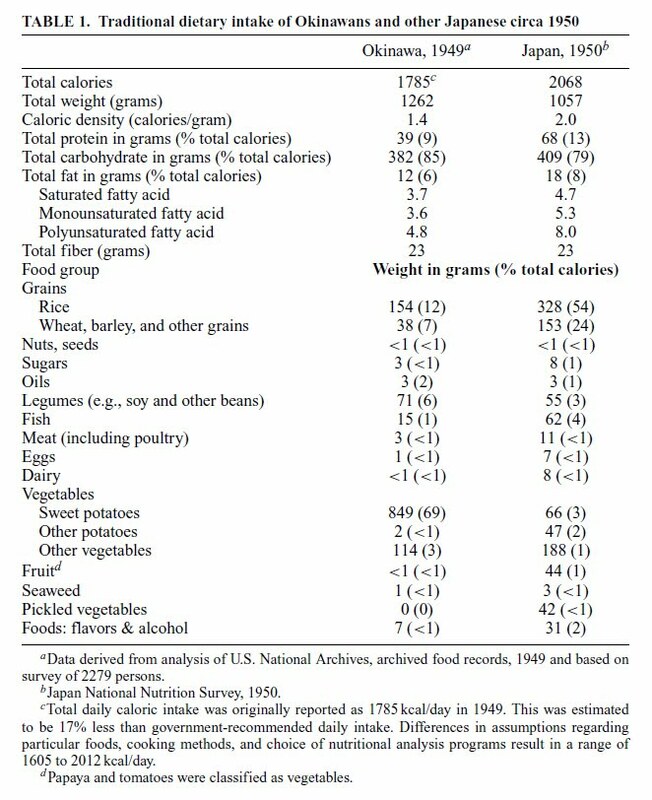 I reran the numbers using nutritional information for Okinawan sweet potatoes and the published table was correct in its conversion of 849g to 69% of calories of a 1785 calorie diet (my calculated percentage: 69.8%). According to freely available nutritional content, Okinawan sweet potatoes are more calorie dense than the typical at about 147 calories per 100g. 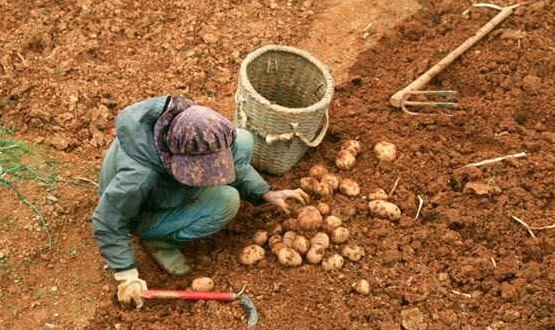 So those of us who live in an area that does not have access to Okinawan sweet potatoes may have to think carefully if we want to translate the reported stats of the Okinawan diet above into something achievable with the sweet potato cultivars available to us. The typical orange flesh sweet potato you’ll find in a grocery store (e.g. Centennial, Beauregard, etc.) has about 90 calories per 100g, while this variety lacks the anthocyanin of the Okinawan sweet potato. Even the Stokes Purple variety that is available in much of the mainland US and does contain anthocyanin has a lower caloric density at about 115 cal per 100g, so one would need to eat about 1080g of Stokes Sweet potatoes to mimic the 1231 calories in sweet potato consumption of the average traditional Okinawan diet. That's about 2.4 pounds. By way of comparison the intake of 849g of Okinawan sweet potatoes is a little under 1.9 pounds. Using a Mettler balance I just weighed a medium sized Stokes purple sweet potato at 205g (which converts to 0.45 lbs.) and a medium sized typical grocery store orange flesh sweet potato at 230g (which converts to about half a pound). So we’re talking about 5 medium sized Stokes purple sweet potatoes or 6 medium sized orange sweet potatoes (to get to 3 pounds) necessary to mimic the caloric intake here (the latter option won’t get us the anthocyanin, but will be more affordable). No, no, no! Okinawans are not Japanese! Okinawa is a prefecture of Japan and was once an independent country. I am Okinawan and my Dad's parent came from Okinawa and spoke Okinawan to each other and he said it was not the same as Japanese. Greger, Michael, MD "Nutrition Facts"
I eat a low-fat, whole-food, plant-based diet these days, hardly any of these foods. I guess I'll leave them up for posterity. Fanatic Cook by Bix is licensed under a Creative Commons Attribution-Noncommercial-Share Alike 3.0 United States License.